Home Others Another CEO Hacked… It’s Twitter CEO Jack Dorsey! Another CEO Hacked… It’s Twitter CEO Jack Dorsey! Twitter account of another high profile has been hacked! This time, it’s Twitter CEO Jack Dorsey. 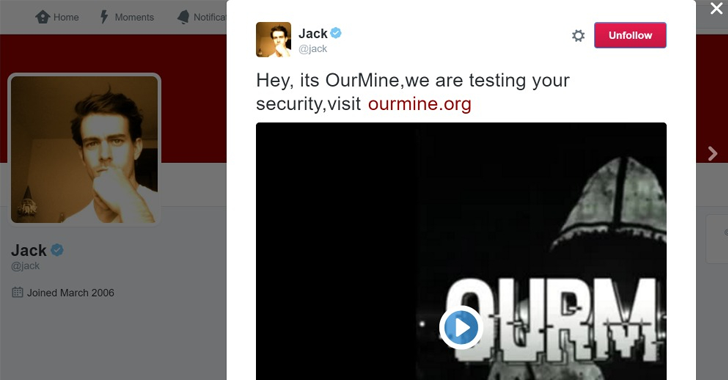 OurMine claimed responsibility for the hack, which was spotted after the group managed to post some benign video clips. The team also tweeted at 2:50 AM ET today saying "Hey, its OurMine,we are testing your security," with a link to their website that promotes and sells its own "services" for which it has already made $16,500. Although the tweets posted by the group did not contain any harmful content, both the tweet and linked to a short Vine video clip have immediately been removed. Since all tweets posted to Dorsey’s account came through Vine, it’s possible that the group had used passwords from recent mega breaches in LinkedIn, MySpace, and Tumblr to hack Dorsey’s Vine account or any other service, which had given OurMine access to his Twitter account. OurMine claims it is "testing security" of accounts and teaching people to secure their online accounts better, though it also offers its support to those it targets, charging up to $5,000 for a "scan" of their social media accounts, website security holes, and other security vulnerabilities. Change your passwords for all social media sites as well as other online accounts immediately, especially if you use the same password for multiple websites. Who is going to be the next in the list of OurMine? Any guesses? Hit the comments below.